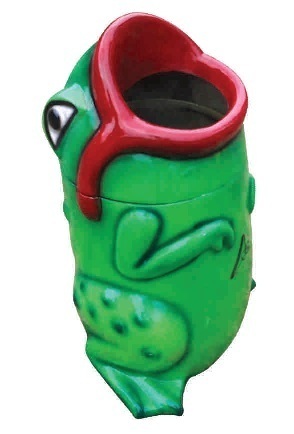 We are manufacturer of Frog Dust Bin in Ahmedabad, Gujarat. A. K. Enterprise is one of the most renowned names of the market engaged in manufacturing and exporting a high quality range of Playground Equipment, Games, Rides and Toys and many more products since 1991. In our product range, we offer Carousel Merry Go Round, Four Seat Merry Go Round, Garden Benches, Wide Slide Metal, Mini Break Dance Amusement Park and Baby Cars. Moreover, we offer Bike Battery Operated, Monkey Climber, Rhino (Kiddie Rides), Belly Bomb, Hit-A-Cat, Walking Animals and others. The entire range is manufactured using high-grade raw material such as metals, plastic and others. We procure the raw material from some of the most trusted vendors of the industry. Moreover, we employ latest technology and machinery for designing and manufacturing these products. We provide installation service to our customers. Our entire range is ideal to be installed at various locations such as resorts, malls, kids parks and others. These products are designed by considering the preferences of children, thus, are widely liked by them. Moreover, we can customize these products as per the exact details provided by them. We also adhere to stringent quality control policies and check the entire range on certain well-defined parameters. The entire range of products is highly admired for its high strength, attractive looks, durable standards, excellent load bearing capacity and robust construction.